Do you live in Colliers Wood? Please take a look at the leaflet Colliers Wood Residents Association (CWRA), have recently produced. 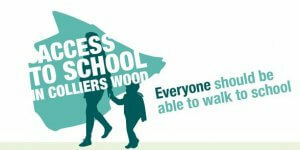 It is about our Colliers Wood primary school and getting a school place there. We have spent three years talking and worrying about it. Already there are families in the Colliers Wood community not getting a place there for their child and this problem will grow as our population gets larger. We believe our suggestion would ease this. It was agreed over many discussions at CWRA meetings. CWRA hold a meeting every other month throughout the year but we know many people are unable to attend, or meetings just aren’t their thing, which is why we did the leaflet and distributed it in Colliers Wood. Your response can be a simple YES I agree or NO I don’t agree, or you can add your own view or experience. CWRA will then send the collated responses to Merton Council. Our bid is to persuade the Council to do a consultation which we hope would result in the Council making an application to the Schools Admissions Authority for an Admissions Priority Area for Singlegate. The next meeting of CWRA is on Tuesday July 3rd at 7.30, St Joseph’s Church Hall, Park Road.